Architecture for DCCS. On the modelling of distributed real-time control applications (M. Torngren). Temporal Properties in DCCS. On the duality between event-driven and time-driven models (F. Tisato, F. de Paoli). Methodologies for DCCS Design I. Dynamic task mapping for real-time controller of distributed cooperative robot systems (T. Lueth et al.). Scheduling Methods for DCCS. Alpha message scheduling for optimizing communication latency in distributed systems (L. Cherkasova, T. Rokicki). Methodologies for DCCS II. Transputer control system with a GAs motion planner for the PUMA560 industrial robotic manipulator (Q. Wang, A.M.S. Zalzala). Temporal Properties in DCCS II. Self configuration protocol for a hard real-time network (L. Ruiz et al.). Dependability Issues in DCCS. Guaranteeing synchronous message sets in FDDI networks (S. Zhang, A. Burns). System Analysis. Deadlock prevention in a distributed real-time system (O.H. Roux, P. Martineau). Real-Time Communication. Integration of wireless mobile nodes in MAP/MMS (P. Morel, J.-D. Decotignie). Applications. Control design for autolab using the reactive paradigm (S. Bajaj et al.). Author Index. 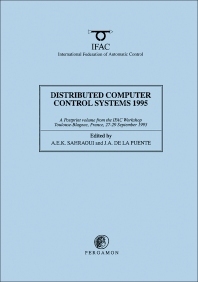 The series of IFAC Workshops on distributed computer control systems (DCCS) provide the opportunity for leading researchers and practitioners in the field to discuss and evaluate recent advances and current issues in theory, applications and technology of DCCS. DCCS'95, the 13th IFAC workshop in the series was held in Toulouse-Blagnac, France. The topics covered at this meeting included: the role of real-time in DCCS specifications; scheduling methods for DCCS; real-time distributed operating systems and databases and industrial applications and experience with DCSS. For researchers and practitioners working on the development of distributed computer control systems.